I asked around when I decided to run my chickens under my rabbit cages (not on top, under only). What I found was that lots and lots of breeders DO mix the two species, without allowing the chickens to roost on the rabbit cages. These comments don't answer the airborne question, however. My main concern was coccidia. I was told that the strains of coccidia are species-specific. I sure hope so! What I can say right now is that my rabbits are completely healthy and so are the chickens. I pray it stays that way, and will definitely publish on this site any authoritative comments or papers we receive. Thanks for the comments and question, Norm. I have raised chickens and rabbits most of my life. I have my rabbits in what my kids call rabbit stalls. No one is in a cage but in stall like pens on the ground with shavings and hay. My chickens get in the pens with the rabbits and really help to keep them clean by scratching and eating left over dumped feed which helps with the control of flies. I raise both animals for food and have NEVER had a problem with sickness in anyone. I even have my baby pens with fans and heat lamps where I put my chicks and weaned rabbits and they too are housed together. I raise everything natural and they get wormed natural too with no problems and everyone is healthy, happy and fat little butterballs. Thanks for the feedback, and for the peak into your system. I like it! You're definitely doing SOMETHING right since you're experiencing no sickness in your herds and flocks. 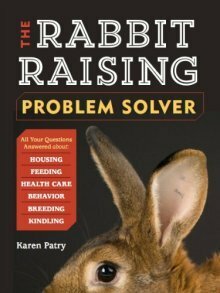 I have to strongly disagree with Rabbits and Chickens not mixing, as long as the chickens are not defecating in the rabbits food and housing they are fine. Chickens are the best natural way to control flies and they help with making compost. I have been raising chickens for about 25 years and rabbits for about 15 years. I have the rabbits in cages on legs in the chicken yard with a roof over the top of them. My chickens have the area under the rabbit cages to catch anything that drops through the wire on the entire bottom of the cages. Under the rabbit cages is also where my compost area is surrounded by cinder blocks stacked 2 layers high. We compost everything that comes out of our vegetable garden we grow and can up or freeze. We also put anything that grows in our yard or flower garden into the compost pile. Our chickens pick out of the pile what they want and scratch in the rest along with their contributions. The pile is then spread out over the garden for the winter to sit until spring when it fertilizes our crops. It is a complete cycle since the rabbits get some of their food out of our garden they contribute to. Polyface farms as well as several homesteaders I've talked to would suggest the opposite. None of them have ever had disease issues with mixing the two. They also stress that while they have some food sources in common, they also have several opposite food sources which means that unless you have both, you end up wasting a third of what could be feed material. I'm not a vet, but if this was a real problem, I'd imagine it wouldn't be such a common practice. Agreed. Maybe by 'mix' they mean in the same space, like both species on the ground intermingled. Dunno, but Polyface keeps their rabbits in cages and the chickens run under the cages turning over the manure. This is also how we do it here at Aurora Rex Ranch. The chickens clean up the wasted feed, eat the bugs, and anything I happen to 'accidentally' drop. I imagine we save quite a bit on chicken feed this way.